KidZania in London has revealed a new facility for its young visitors in partnership with Middlesex Cricket, called ‘Lord’s Cricket Ground at KidZania’. 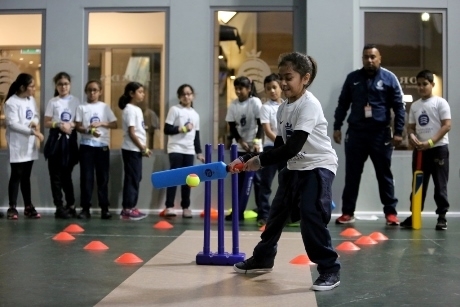 Middlesex Cricket’s mini ‘Home of Cricket’ has been designed and created to look like a real cricket ground, providing children visiting KidZania with the opportunity to ‘take part in the game, get active, have fun and learn life lessons’. The cricket ground, open now, will support topics including teamwork, nutrition, healthy lifestyles and good sportsmanship, and tie in with Physical Education and PSHE. At over 200 metres squared, Lord’s Cricket Ground at KidZania has the iconic Lord’s Pavilion on one side and the Lord’s JP Morgan Media Centre on another. It comes complete with seating, floodlights and Middlesex and MCC branding around the ground, and is designed to be a replica of the real grounds. With almost 30,000 children actively taking part in Middlesex Cricket school projects in the last twelve months in over 450 Primary, Secondary and special educational needs schools across Middlesex, the new partnership with KidZania is hoped to allow Middlesex to further its engagement with youngsters in the capital. The cricket club hopes to introduce the game of cricket to a new and youthful audience and meet its participation objective of getting more cricket bats and balls into the hands of children across London. Middlesex Cricket’s chief executive, Richard Goatley, commented: “We are absolutely thrilled to open the doors to Lord’s Cricket Ground at KidZania and are really excited at the opportunities this creates for us to increase the exposure of cricket to a much wider audience.